If you are new to the world of event planning and organization, you probably look at vendors as being less important than the event organizer. In reality, you should treat vendors more like partners, as they can be the ones who make or break your efforts to succeed as an event planner. Starting out successfully in the event business is not so much about building up a string of returning clients, as it is building a reputation of someone who can deliver what they have promised. If you have a reputation for being able to supply the goods, no matter what the client’s requests are, you will soon have a steady string of clients and you will be off and running. Maybe in the situations of events you have done early in your career, you simply looked for a vendor, told them what you need and asked them what it cost. Then, if you were really diligent, you called a couple of others and used the initial quote as a baseline to learn which ones were cheaper. This was fine when you were doing events on a limited basis, but now you are working full-time on events and you need to take an entirely different approach toward vendors. Now it is about building relationships. When you are staging events on a full-time basis, vendor ‘availability’ will be your biggest hurdle. This is the thing that causes so many unprepared event organizers to tear their hair out in frustration and spend their days begging on the phone to get services for their events. If you approach the contacting of vendors correctly from the start, you can avoid this problem entirely. Their services will be available whenever you need them because you will have been proactive and gone out and introduced yourself around to the vendors, had a look at what they each have to offer, talked capabilities and maybe prices way before you have had your first client inquiry. You need to get to know your vendors and you need them to get to know you as well. Buy them a coffee, explain what you plan to do, who your aiming for as a client base, the scale of the events you are comfortable in staging and the amount of business you may be able to provide them with. You will learn the about vendors’ inventory, staff capabilities, pricing, set up and break down times and requirements. Mainly though, you will be going through this exercise simply to increase the chances of the vendor being available for your event needs. We have created a worksheet for you to print or save. Click here to download it and use it when networking with vendors. Availability can be every bit as big of a headache as meeting a client’s budget. Being a stranger does not make it any easier. The new event planner who simply calls up an AV supplier wanting to rent a P.A. system for a wedding reception in the middle of the busy June wedding season will likely be greeted with laughter. However, looking at it from the flip side, if you are a vendor and it is someone you know on the line asking for your help, you will be willing to jump through hoops because 1) you know their business is growing, 2) you know they have a steady client base and 3) you know that they will use you again. The availability issue is also the reason why you need to introduce yourself to more than one service provider for each category of service. If you live in a fairly small community that has three catering companies and they all produce high quality food, you should, by all means, spread the work around. This will ensure you of a greater chance of having an available caterer when event season rolls around. A rational vendor knows that this is a sound business practice on your part, and will not feel offended. They know that this is done to ensure your business of availability as well as variety, so you should never feel guilty or apologize for doing it. They will probably even approach you if they hear that you have lined up a particularly large or high-profile event and compete for the supply contract. A vendor that does take it personally is sending up a red flag. They are letting their ego get in the way of their business sense, and are trying to take advantage of the relationship you have with them. In a busy event season having a wealth of vendors to choose from may just be the deciding factor in your ability to keep saying ‘yes’ to your client’s requests. Having a reputation among your clients as the go-to person who is able to supply the most oddball request is a good way to guarantee yourself of steady work. Especially when you have corporate clients who put on frequent events. Having a lot of suppliers is especially crucial if you have multiple events happening at the same time or a cascading series of events that do not allow for one vendor to set up and break down in time to handle all of them. Having a variety of different-sized vendors can also make a big difference in their ability to provide appropriate levels of service. A vendor used to working events for thousands of people at the minimum, might not be a good choice for a small conference, and a really high-quality vendor with a small staff, as much as you want to use them, probably would not display that same quality in their service for a large crowd that would put them out of their depth. 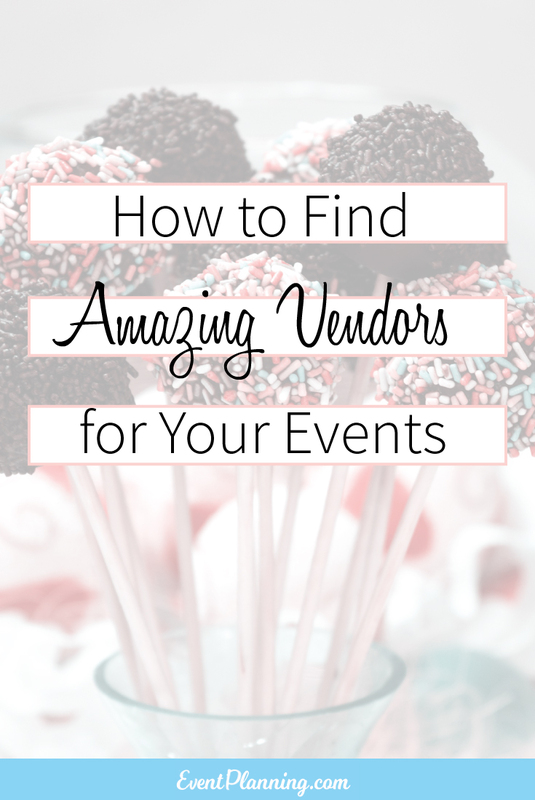 The more you get to know your vendors and what they can deliver, the easier of a time you will have in choosing the right ones to work your events. This will reduce the stress levels all the way around. You will be comfortable in promising a level of service to your clients that you know your vendors can deliver and the clients will become more comfortable knowing you will deliver on your promises. Your vendors will look forward to working with you as you will be able to use their talents to their best advantage, which will make them look good in the process. Achieving this symbiosis is the best thing in ensuring that you always have vendors who are available when you need them. Getting cozy with your vendors can be the best move that you make in being able to excel at the events that you plan. Great information. Enjoy reading anything that has to do with event planning. It gives me good ideas to help me improve. Great tools for the trade. Thank you for providing these informative articles. Reliable professional event vendors are every went planner’s key to success! I plan a lot of corporate events, locally and globally. You can always learn more in order to increase your knowledge in the industry. I enjoyed reading this information. If it’s not to much to ask, I am in school right now for this. Would you mind emailing me about this field? It would be great to have some insight on something I plan to have a career in. The truth is that in a very competitive environment, such as capital’s hospitality industry or the wedding planning industry to be more specific, it’s all very tight, even if we want to develop the business further and work with new wedding vendors we often have to hold the horses as we don’t know the people, working around their schedule is often too much of a hassle so in the long run in all comes to doing repeated business with our solid providers/vendors and the same venues we know the best. Thank you very much for sharing it’s very useful article.